Clear canopies can be an absolute nightmare when building a model plane. The clear plastic parts can be scratched, or have moulding imperfections in them. If the kit has been badly engineered, then attachment points to the sprue are in obviously visible locations and are almost impossible to remove cleanly. Worst of all, how do you glue a clear canopy to the kit without the glue fogging up the part? Don't panic, dear intrepid modeller, there is a way to easily solve all this. It's actually pretty damn simple. Future floor polish is your friend when it comes to a clear model canopy. Now that is one clear, clear canopy. 1. I can't find a product called "Future". No problem. In some countries it's called Future, in some it's Pledge, in some it's Johnson's Klear. Doesn't really matter. Find yourself a clear, hard-wearing floor polish liquid, with the consistency of a thin oil. Buy it. Test it on a bit of clear sprue. If it doesn't eat the plastic, you're good to go. 2. It will turn yellow over time. Watch the video. The liquid in the bottle might, but the thin, thin layer on your canopies won't. I promise. 3. It looks too clear, real planes in period photos didn't have crystal clear canopies. Three replies to this. a) If I were a fighter pilot, I would want my canopy as blemish-free as possible to clearly see threats/targets. b) You can always weather the glass once it's on the model if you wish. c) If there are imperfections or scratches in the plastic, you need to rectify these somehow. My video shows you how to go from a scratched, iffy mess to a perfectly clear canopy in a couple of ridiculously easy steps. 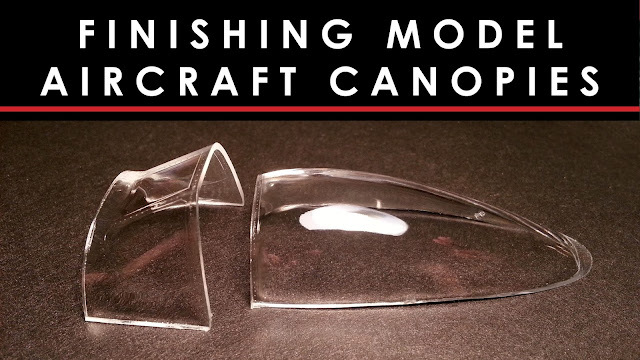 or the video link is here: Finishing crystal clear canopies on scale model aircraft.